Most consumers who are always on-the-go conveniently grab a small bottle of fruit juice and get ready for the day. Being an instant source of essential nutrient, no wonder why fruit juices are a popular thirst-quenching drink and a great partner for a meal. This isthe main reason why many fruit juice manufacturers thrived in the competitive food and drink industry of UK. The demand for fruit juicealsospurred the application of automation in its processing and manufacturing. With automation, it eliminates direct human interaction towards the produce.Italsopromotes a sanitary practice which therefore improves the shelf life of the product. However, manufacturing operations require accurate data input necessary in automation and other computing functionalities. Thus,ruggedisedcomputers with industrial keyboards are utilised to ensure accurate output.Its rugged protection sealing allows the peripheraland internalto work optimally even under the presence of dirt and liquid intrusions. So, how do fruit juice manufacturers canoptimiseits computing system withan installed industrial keyboardforoperation?Keepreading this blog to know its advantages in fruit juice production operations. Fruit juiceprocessingstarts with the acceptance of raw material, fruit pulp preparation and processing and juice yielding. Afterwards, the unclarified juice goes through the pasteurisation and de-aromatisation processbefore it ends uptofilling and bottlingprocesses. Now, everystep inprocessingfruit juice requires the aid ofan automated system.And, this systemshould beintegratedtoruggedcomputers equipped with reliable peripheralsincluding keyboards.Therefore, an industrial-grade keyboard isidealfor manufacturing applications due to its robust construction and ergonomic design. Data inputcan bemore convenient for operators which result in accuracy and reduced miscalculations. 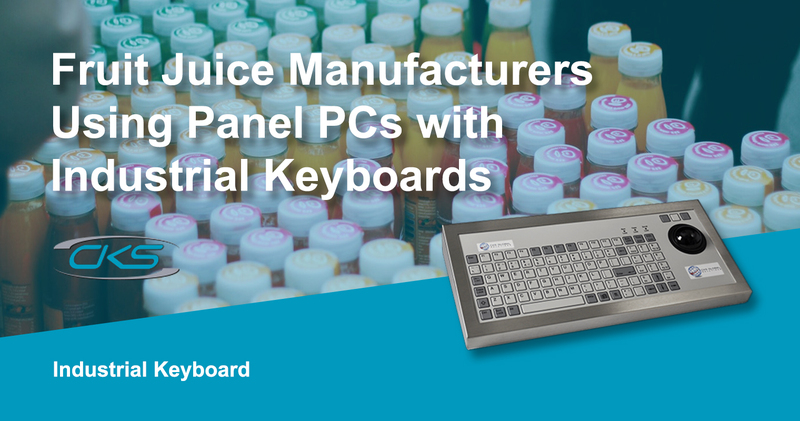 So,what makes an industrial keyboard an indispensable device for computersin fruit juice manufacturing? Read through the next section to understand its essence in processing operations. Industrial-grade keyboards have sealed mechanical switches which allows it to performefficientlyeven under extreme usage. Moreover, a rugged peripheral has a high IP/NEMA protection rating.This means that the inner components of the deviceareprotected from damaging elements such as moisture and fruit by-product intrusions. Also, the ruggedkeyboardcan last under the presence of extreme temperature and shock. Different mounting options provide convenient installation and setup in many work areas. Rugged keyboards have many alternate placement options which makes it convenient to setup in limitedworkspaces. Its ergonomic mounting solutions offer personnel more efficiency and accuracy in typing in data or managing commands necessary in automation. Production plants require well-organised work areas, so having a rugged keyboard with pointing device is an excellent choice.Industrial keyboards with integrated pointing devices are ergonomic and efficient solutions for fruit juice production operations.Operators can work systematically since data entry and interface navigation functionality is combined with only one device. Streamlining an operation is one of the great options to meet the increasing demand for fruit juice production. What’s more, it is also an effective contributing factor in increasing the ROI. But, building a reliable computing system with advanced applications is the right computing solutions. And, having the best peripherals can also offer a more systematic and ergonomic workflow in a fruit juice manufacturing facility. So, find a trusted IC provider today to learn more about using industrial keyboards for manufacturing operational needs.